Australia and New Zealand’s assistance is authorized by the Wildfire Suppression Assistance Act (P.L. 101-11) emergency provision, which states: “with or without an agreement” the U.S. Government can request assistance from foreign fire agencies. This new arrangement will allow us to draw on the Australian fire agencies during critical fire seasons. On September 9, 2001, the Secretaries of Agriculture and Interior signed an agreement with Australian Prime Minister John Howard for mutual assistance in firefighting between the United States and three states in Australia. Similar command structures, training and physical requirements allow the New Zealand and Australian firefighters to easily blend into the upper level ranks of American wildland fire organizations. Through the NIFC-CIFFC Agreement the U.S. provided two heavy air tankers and two lead planes to Ontario, Canada for one day. On May 20 the U.S. mobilized 10 crews and two overhead personnel to Alberta. These resources were released back to the U.S. on June 4. In addition, Canada provided two air tanker groups to the U.S. On August 4 British Columbia provided two air tankers and one bird dog. On August 26th Alberta provided two air tankers and one bird dog to the U.S. On September 3 the U.S. released to air tankers and one bird dog back to British Columbia. On September 9 the U.S. released two air tankers and one bird dog back to Alberta. Through the NIFC-CIFFC Agreement the U.S. provided crews, overhead and an airtanker to the provinces of Alberta and Saskatchewan. On July 5 a heavy airtanker mobilized to Alberta. The airtanker was released back to the U.S. on July 14. On July 10 the U.S. mobilized three crews and seven overhead personnel to Alberta as well as two crews and twenty-three overhead personnel to Saskatchewan. These resources were released back to the U.S. on July 27. On July 19 the U.S. mobilized an additional five crews to Alberta. These crews were released back to the U.S. on August 4. Through the NIFC-CIFFC Agreement Canada provided crews, overhead and air tankers to the U.S. On August 20 five crews from the province of Ontario, one Convair 580 airtanker group from both Saskatchewan and Alberta were mobilized to the Northern Rockies Geographic Area. On August 22 one CL415 scooper group from Ontario joined the fire suppression efforts in the Northern Rockies Geographic Area. On August 27, fifty eight overhead from Alberta and Ontario mobilized to the Northern Rockies Area. On August 31 an additional CL-415 scooper group from Ontario Canada was mobilized to the Northern Rockies Geographic Area and then was re-assigned to the Great Basin Geographic Area on September 2. On September 7 the five crews from Ontario and two CL-415 scooper groups were released back to Canada. On September 8 both Convair 580 airtanker groups were released back to Canada. On September 9 all fifty-eight overhead were released back to Canada. On August 27 sixty-eight overhead personnel from Australia and New Zealand were mobilized to support fire suppression operations in the Northwest Geographic Area. On September 27 all Australian and New Zealand overhead personnel were released back to their home countries. Saskatchewan, Canada provided a Convair 580 heavy airtanker and a Turbo-Commander 690 Bird Dog to NIFC, through the NIFC-CIFFC Agreement, for fire suppression mission use beginning on July 21. The airtanker group was in place until July 30, when it returned to Canada following a recall from Saskatchewan due to increased fire activity there. Through the National Interagency Coordination Center, Canada provided heavy air tankers and aerial supervision modules ("Bird Dogs") from British Columbia, Alberta and Saskatchewan. The first aircraft arrived in the U.S. from Saskatchewan on July 3. Alberta provided two additional air tankers and two Bird Dogs in early August. British Columbia also provided two more air tankers and a Bird Dog later that month. By late August there were six Canadian air tankers and four Bird Dogs assigned in the U.S. These aircraft flew numerous missions in Idaho, Montana and several other western states. The last aircraft were released back to Canada September 3 due to reduced fire activity in this country. Canada also provided 24 Smokejumpers from British Columbia to Missoula on August 24, and they were embedded at several jump bases in the U.S. The last Canadian Smokejumpers were released on September 8. Additionally, five 20-person crews and nine overhead were brought down from Ontario to the Northern Rockies on August 26. These crews were released on September 7. Through the National Interagency Coordination Center, Canada provided five air tankers and three aerial supervision modules ("Bird Dogs") from British Columbia, Alberta and Saskatchewan, as well as two liaison officers. The first aircraft were mobilized between June 6 and June 12 from British Columbia and Saskatchewan. Another air tanker and Bird Dog were arrived July 9 from Alberta. These aircraft flew missions in many western states. The last aircraft were released back to Canada on July 12 due to increasing fire activity in that country. Canada provided five Convair 580 airtankers and three aerial supervision modules ("Bird Dogs") from Alberta, British Columbia and Saskatchewan. The first contingent of aircraft arrived in the U.S. on August 27, and the last aircraft departed on October 29. Manitoba also provided a CL-215 and CL-415 water scoopers, and a Bird Dog to the Pagami Creek fire in Minnesota. These aircraft were assigned from September 14 to September 27. Australia: In January the United States sent 12 fire managers and specialists to Australia for 34 days. A second contingent of 16 personnel departed for Australia in February for assignments lasting up to 40 days. Haiti: The National Interagency Fire Center mobilized two radio technicians along with 300 radios and five repeaters to Haiti in January following that country’s earthquake. The technicians were assigned a total of 17 days. Canada: The U.S. provided 30 smokejumpers to British Columbia, Canada in August (in two separate contingents). Infrared aircraft flew 18 fire missions in British Columbia and Alberta (five infrared interpreters were utilized to analyze the infrared data back in the U.S.). Additionally an interagency 20 person Type 2 initial attack crew from the Eastern Area was mobilized to a fire in Quebec in July. Russia: The U.S. provided 100 large capacity water tanks, 1,500 hand tools and 1,000 pairs of goggles in support of the massive wildfires that occurred there in August. Israel: The National Interagency Fire Center mobilized five members of Custer's NIMO to support a U.S. Agency for International Development Disaster Assistance Response Team (DART) in response to wildfires burning in Israel’s Carmel Forest. The team members were assigned from December 4 through December 10. Three 20-person crews were initially staged in Boise for a 24 hour period, but then released. In February the United States sent three Burned Area Emergency Rehabilitation (BAER) teams, a 20 person crew and 15 fire specialists (a total of 73 personnel) to Australia. The last of these resources were released in early April. The U.S. also provided one national Type 1 Incident management Team and 20 smokejumpers to British Columbia, Canada, in August. A total of 44 Australian fire operations specialists were utilized during the northern California fire siege. The US sent 67 specialists to help with fires in Australia. Canada provided ten 20-person crews, 11 smokejumpers and 59 overhead to assist suppression operations in the US. Additionally up to 115 fire specialists and management personnel from Australia and New Zealand were assigned to western fires in August and September. The Australian and New Zealand firefighters were demobed on Sept 17, 2006. Through an established International Arrangement, 44 Australians and 10 New Zealanders were mobilized to the United States on August 27 and departed on September 15. These overhead resources were deployed to western Montana, filling critical command and operations management positions. In January 2003, during the peak of the Australian fire season, a contingent of 36 US fire specialists was sent to the state of Victoria for a month along with an infrared aircraft. They arrived starting Jan 18 with the last person and the infrared aircraft returning March 2. 150 people from Canada served in various overhead positions, and a total of 25 Canadian Type I crews helped fight wildfires. These crews represented an increase of about 30 percent of the number of Type I crews that were available to fight fire. Fifty of the most highly trained and experienced firefighters from New Zealand and Australia arrived at NIFC on August 8, 2002 to help manage western wildland fires. These firefighters filled the most critical resource needs for fire suppression in the United States, which were for mid-level supervisors, and experienced aviation managers. This group includes 15 helicopter managers and 10 helibase managers. The ground firefighter supervisors were deployed on August 11 and the air operations firefighters were deployed on August 12 after an orientation at NIFC. 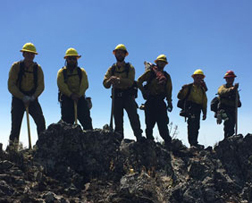 All the Australian and New Zealand firefighters went to fires in southwestern Oregon. At their demobilization point on September 12, the Australian and New Zealand firefighters had completed two two-week assignments, with two days R&R between their assignments spent in Eureka, California. In 2000, over 500 individuals from Australia, New Zealand, Canada and Mexico assisted in fighting wildfires. Although fire management personnel from the United States, New Zealand and Australia have exchanged research, training, and technology for years, the summer of 2000 was the first time their firefighters fought fires on American soil.